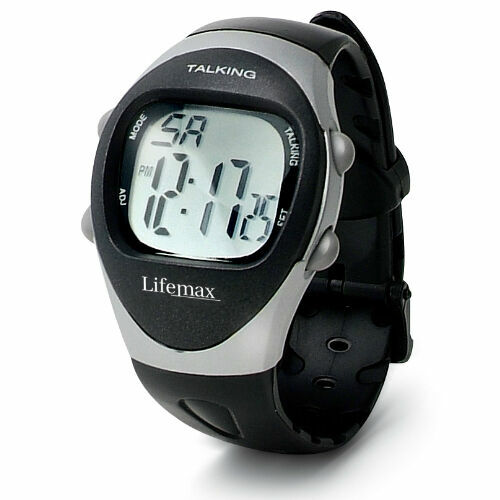 A stylish digital watch with an oversized LCD digital display, finished with a black and silver case and black strap. The watch is fitted with a CR2016 Lithium battery. item 2 Talking Big Digit Digital Watch. -Talking Big Digit Digital Watch. IT WORKS WELL,ITS A BIT OF A BIND TO SET TIME,BUT WHEN MASTERED IT KEEPS GOOD TIME LOSING ABOUT JUST 2 SECONDS A DAY...THE BIG DIGITS ARE EASY TO SEE WITHOUT SPECS. I MUST STUDY THE MANUAL TO STOP IT SAYING THE TIME EVERY HOUR THROUGHT- OUT THE HOUSE.!! THE TALKING CAN BE HEARD EASILY,BUT NOT HELPFULL WHEN NOT WEARING IT..BATTERY REPLACEMENT LOOKS TO BE A NIGHTMARE,AS THE BACK IS HELD ON WITH SCREWS.? NOT A PROBLEM BUT REMOVING IT I THINK WILL BE A PROBLEM..
A member of the family, was very pleased with the facilities, on this watch. It enabled him to plan his day and times of medication. The watch itself, is bulky. It is fit for purpose,and good value for the price. You will not get rave reviews, for your comments, "Stick to the facts about the product. "It looks aggressive, and patronising. Great watch work's very well not a very good plastic strap though but for the price would definitely recommend. Poor quality item , which dosnt come with batteries nor no mention of lack of batteries in description. Buttons on the watch are very stiff and hard This product is unsuitable for a person suffering from dementia .